This article is about the outcome of an experiment I ran in the last two years growing potatoes in bags. It´s also about the difficulties and advantages of this technique. I am posting this in May as it is the time of year when you want to put your shooting potatoes in the ground. Or in bags. The last two years I have been planting potatoes in bags. I read somewhere that you could fill up the earth when the potatoes plant is growing, adding it up to 70 cm. I used old coffee bags (quite big ones, you can see them in the pictures) made out of jute. 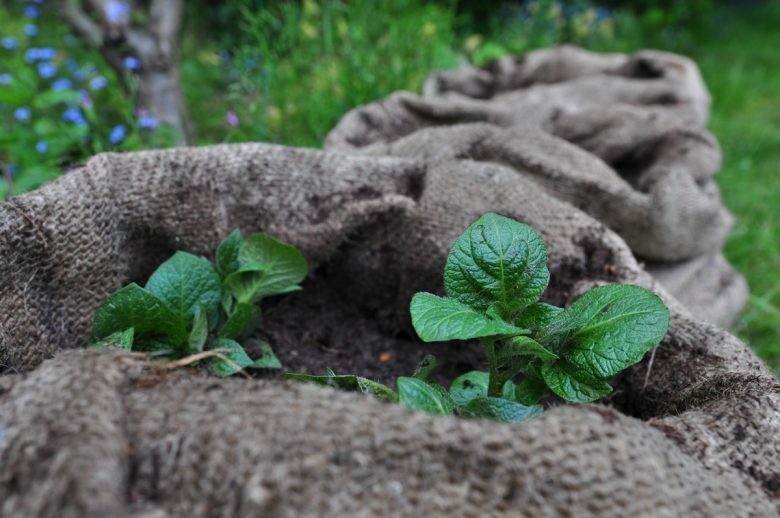 The aim in growing potatoes in bags is to encourage the potato plant to grow more roots and therefore more potatoes at parts of the stem that are eventually buried in the earth. The first year I tried this, the yield seemed average. The potatoes where only growing in the very base of the sacks and the whole part of the stem being covered with earth in the growing process did show small signs of new roots, but none of them developed to growing potatoes. I reckoned the reason could have been that the earth in the middle of the sack, where the roots did not develop potatoes did not get enough water: the earth was was sandy and the sack was filled up high and upon dismantling it seemed very dry. The earth at the bottom of the sack did get wet from the ground so it could be that it received enough water there to grow potatoes. The second year I then tried to use the observations from the year before, but this time I put some gravel and a stick in the middle of the sack. The idea was to make sure enough water would infiltrate the earth at all levels of the sack. To compare how this worked yield-wise, I planted another crop of potatoes regularly in our garden beds. I planted roughly the same amount of potatoes. I am aware it´s not an exact experiment, as I was not counting the potatoes. In the garden beds I used a traditional method, earthing up, to stabilise the plants and encourage root growth and therefore growth of more potatoes. (It´s basically the same idea with the growing in bags). If there is a garden bed available to grow potatoes in, I would suggest regular growing over the growing in bags technique. The yield is approximately the same from my experience and the potatoes additionally help loosening the soil and you save a lot of work, by not shuffling earth into bags and out again. If you only have a balcony space or you are growing stuff in containers on concrete, or you live in areas with contaminated soil; growing potatoes in bags is a good option. I therefore suggest to use smaller bags, made of non degenerating materials, like plastic bags from rice or other grains. In Berlin I talked to people from an urban garden (prinzessinengarten) and they suggested to ask breweries for these kind of bags. And the bags they used where just the right size. When you grow the potatoes in these smaller non degrading bags you can reuse the bags every year. You can use the earth in which you grew the potatoes in for other plants on your site. You can use the traditional method of earthing up with these small bags to give the potato plant better hold and encourage growth of roots.